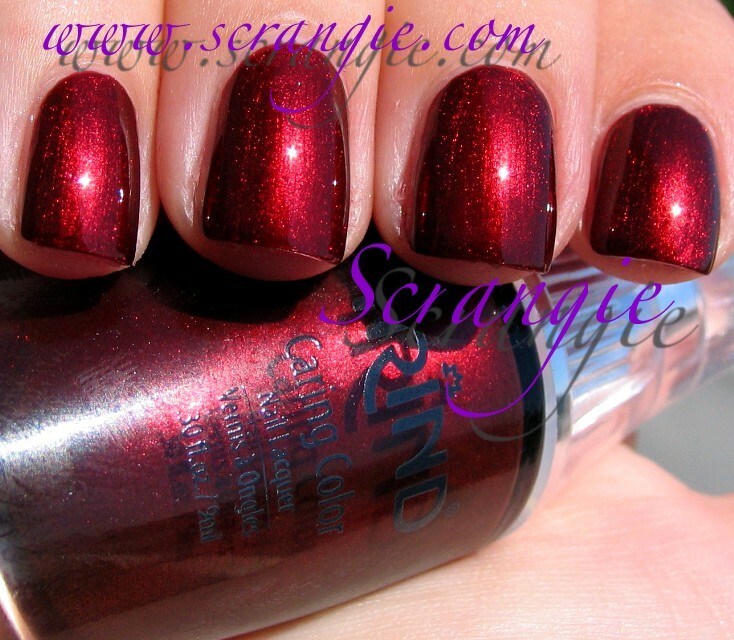 I have another little group of Trind Caring Colors nail polishes swatched, and this set is perfect for fall. Take a look! CC116. This is a cool bright cherry red with some pink, red and silver subtle shimmer. CC119. 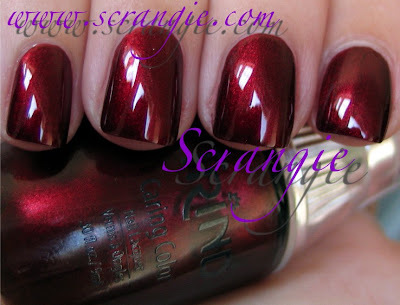 Gorgeous velvety-looking dark warm red shimmer. Looks blackened indoors but very shimmery in sunlight. CC120. 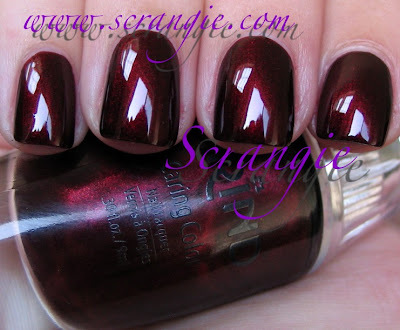 Similar to CC119, but this one has a bit of purple and brown undertone to it. It's darker, too, but still has that glorious glowing embers look. CC121. This may be my favorite of all the Trind Caring Colors. 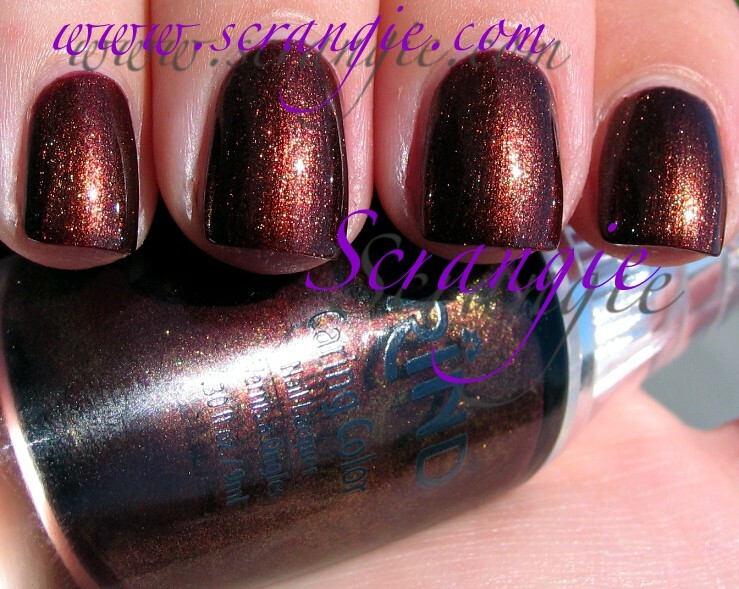 It's a warm brown with hints of red and orange plus big chunky gold shimmer. I love this. A lot. CC122. This one was so hard to capture and it still doesn't look right in my picture. 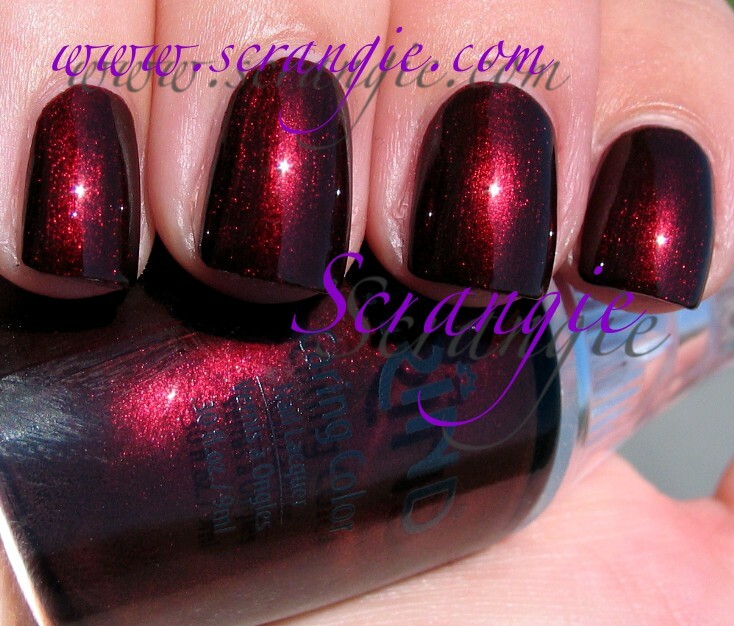 It's a dark berry burgundy with some extremely subtle purple shimmer. Almost invisible, but you can see some speckles when the light hits it just right. CC123. Deep blue-purple frost. 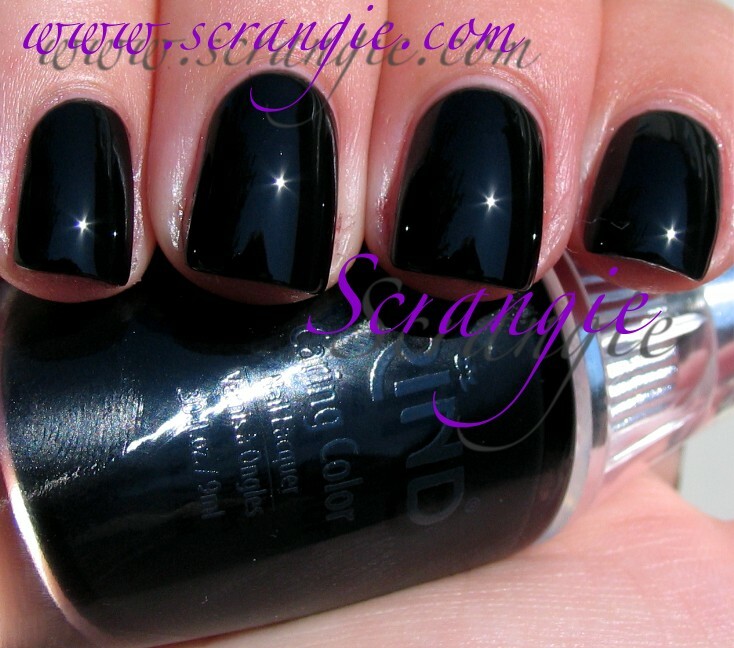 Reminds me quite a bit of Orly Midnight Star. CC124. Plain black creme, borderline jelly. Similar in texture to China Glaze Liquid Leather. The formula on these was good, nice even texture, went on smootly. I did three coats of each. A few of the brushes were defective with random little bristles sticking out, so I trimmed them. Otherwise, pretty nice brushes with nice long decorative handles. Drying time was good, but most dried dull so I used topcoat for these swatches. I like this group of colors a lot. They may not be terribly unique shades, but most of them are extremely pretty, very much my type of colors.. I love those dark, black-around-the-edges glowing embers type shimmers. That autumn gold-brown is my favorite, though. 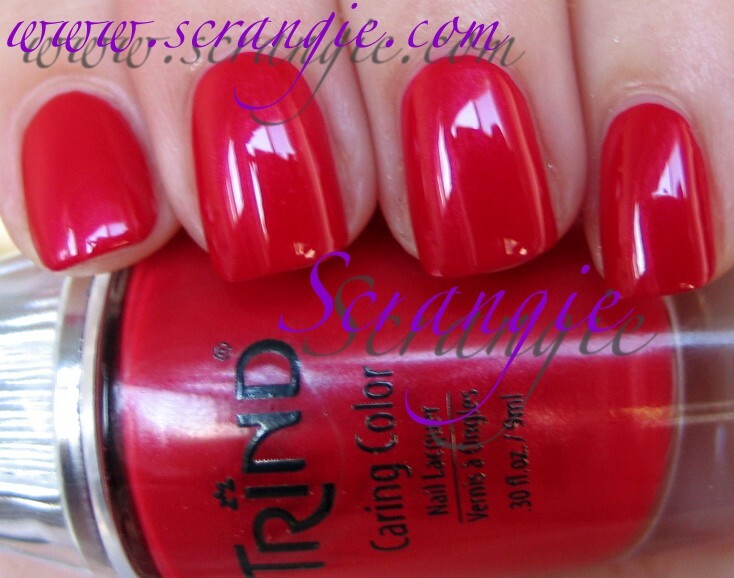 To see the rest of the Trind Caring Colors and a more thorough review, check here. Trind polishes and treatments are a little pricey, so if you're thinking of picking some up, use promo code scrangie on Trind.ca to get 20% off your order (expires January 15th, 2012). Haven't seen this brand before.. those are some gorgeous reds!! I haven't seen this brand, either. Love the gorgeous fall colors! I have never heard of this brand before! I am in love with most of the colors!!! Thanks a bunch for the swatches!! CC120 is my favourite, although it reminds me a lot of OPI Royal Rajah Ruby or something like that. And it's cool that you have a coupon code to offer your readers. :D Thanks for sharing. These are perhaps my among my fav of the fall collections! LOVING! Have heard of the brand name - not sure where to purchase. Off to look for etailers. Never heard of this brand. The polishes all look so pretty. Love all those gorgeous reds. OMG...i want to find C119!! I love the color!! LOVE CC119. Thanks so much for the swatches AND the disc. code!That will help a lot!